Come join the Campbellford/Seymour Community Foundation at the Aron Theatre for the Grant Announcement Event and Annual General Meeting. $155,000 in Grant Funding will be presented to 28 local organizations. They have invited two guest speakers to talk about pollinators. 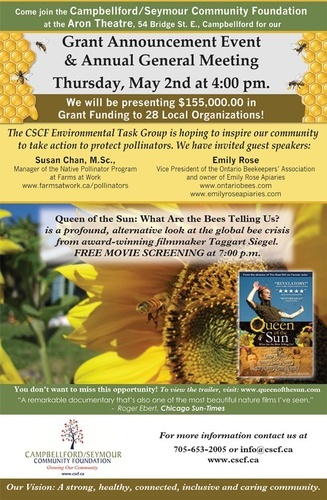 It should be very interesting - Susan Chan from Farms at Work will talk about pollinators, and Emily Rose from Emily Rose Apiaries will talk about honeybees.